Many in the audience were there for the library issue. How do I know? I asked them all to stand when I got up before the Council when it was my time to speak. I had arrived in the Council Chambers on the 12th floor of City Hall about 10 minutes before the Council was to take its seat. Immediately filling out a Speaker’s Slip in opposition to the only item on the agenda – the Mayor’s proposed budget cuts, I noticed the Chambers filling up quickly. An platoon of firefighters in blue T-shirts filled up an entire section of the massive room; a large contingent of gray-haired older women from the Friends of the San Diego Library took up another section – they were all wearing blue too. Right away I ran into other folks from Ocean Beach, like Suzi More of the Friends of the OB Library, my neighbor from across the street and two of her young daughters, and other people who had been at an OB strategy meeting the night before held at Kathy Blavatt’s house, an OB activist who has jumped into this issue. I also ran into my landlord’s ex-girlfriend who I hadn’t seen in decades, plus George Murphy – a Planning Board activist, also Anna Daniels, the library activist who is trying to organize rallies at each of the 7 libraries slated for closure next Saturday, and then Kathy Blavatt herself, who gave me a sign to hold but I placed it at my feet. In all I counted 18 OBcians including a couple of Point Lomans in attendance. OB residents took up an entire row where I was sitting. I had taken a seat next to More and Blavatt, and we awaited our turn to speak with varying levels of nervousness. Toni Atkins started the meeting off, and right away Mayor Sanders got up to respond to the Independent Budget Analyst’s critique of his budget proposals. And that was the context of the meeting. 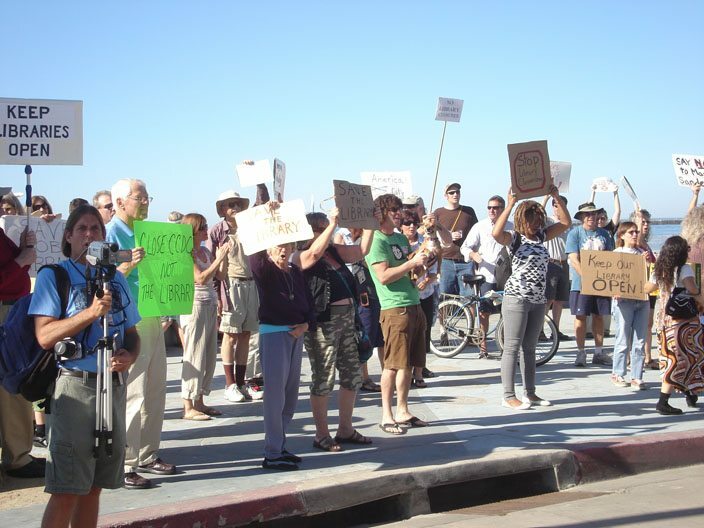 The voiceofsandiego says Mayor Sanders fired a shot across the IBA’s bow. The IBA, don’t forget (see our earlier post on its recommendations here) had offered a different process than the Mayor’s quick fix of plugging the $41-3 Million shortfall. The IBA, in the form of Andrea Tevlin and her staff – who work for the Council independent of the Mayor’s Office – had said don’t close the libraries and rec centers, and recommended waiting until the new Council has time to study and evaluate a comprehensive plan for early February 2009. The plan would deal with finding funds, deal with the libraries that have plans for expansion, like Ocean Beach and University Heights, which are both also on the chopping bloc, and a myriad of reasonable issues, points and questions. Sanders took the IBA to task; he was asking for ‘immediate action,’ the IBA was seeking ‘procrastination;’ he accused it of delay and of pitting community against community. When the Mayor finished, he turned and immediately walked out of the room. It was weird. There was no applause, and Chair Atkins had already warned the crowd not to display its approval or displeasure except by hand signs – thumbs up if you agree, down if you don’t. I’d rather clap and jeer myself. It’s more human and it doesn’t really have to be disruptive. So, when the Mayor walked out, it was almost quiet. Next Andrea Tevlin gave her come-back, emphasizing that despite the Mayor’s proposal for ‘temporary’ closure of the libraries, his projected budgets for the next 5 years keep them closed for at least that long. This, she said, ‘warrants more discussion.’ She went on to other parts of the budget proposals for fire and police. I heard her identify $9.5 Million just from TOT surplus, release of principle reserves, and a waiver of the new Prop C Mission Bay funds. She identified other sources of potential funds as well. After Tevlin, other reports were given, with sparks flying briefly between Michael Aguirre and Mr. Wescoe of the Pension Fund. As the speakers dove us into graphs on the overhead screens, speaking in millions, I noticed a few heads start to tilt forward, eyes glaze over. The Park & Rec Director, Ms. DeMedico spoke. It was a heartbreak she said to close rec centers. But she and her staff had done their best. Then Debra Barrow, head of the San Diego Library, spoke. Closing each library 7 and a half hours a week was just too impractical, besides she and her staff had done their best to find solutions, and it was just best to close those chosen. I never thought I’d hear a librarian call for less libraries but I did today. What was her choice? She could have said ‘no’ to Mayor Sanders and lost her job. Maybe the public would have rallied to her. Maybe. It’s just too impractical to have to move around staff, create more part-time staff. Never mind that libraries have already been cut back a whole bunch of hours over the last few years. Did you ever notice how the libraries have odd hours? Go ahead Mayor Sanders close those seven. When Barrow turned to leave the podium and take her seat, she was smiling. I was sitting just a couple rows behind her. Why was this woman smiling? Finally the public got to speak. Atkins had announced that because of time constraints, public comments were being limited to one minute. One minute! That’s nothing. Usually it’s three. The priest in the row in front of me, starting furiously editing his planned speech. I could see he had scratched out whole sections. A lot of people speaking were against the library closures. People from Clairemont, from Allied Gardens, and from Ocean Beach. People I didn’t know, young mothers who have to take the bus to the OB Library. We were well represented. Finally, Suzi More was called. I whispered ‘don’t be nervous.’ She got up and proudly addressed the Council, waving the bunch of petitions with 1200 signatures. I was next. I got up, without a written speech or anything so formal. I muttered something like you can’t express all the pain and grief out there in the community in one minute. 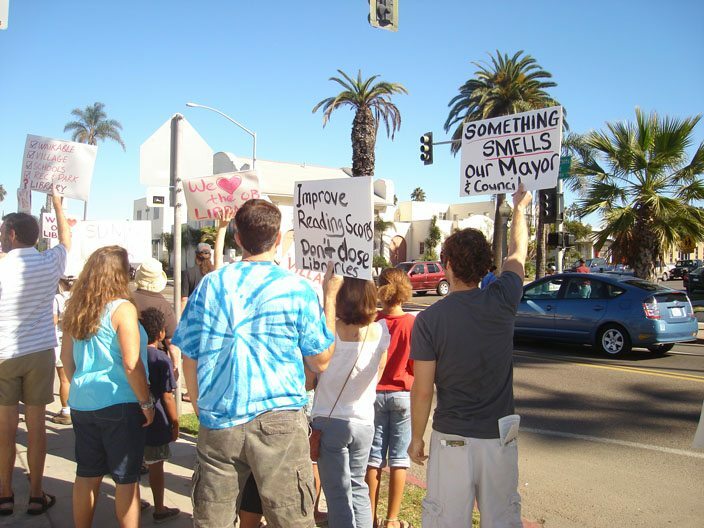 I did add that we had organized a rally in OB, glancing at Councilmember Faulconer, who nodded, and then repeating that we had collected 1200 signatures -‘there’s only 14,000 people who live in the community,’ I explained. I then turned – as Atkins was telling me my time was up – to the crowd and asked all who had come for the libraries to stand up. I didn’t take a count, but over half the Chambers stood. Nov. 15 rally against the OB Library closure. We’ll come back on the 24th, even though public comment won’t be taken. There’s rallies at each of the libraries on the chopping block this coming Saturday, the 22nd at noon. This ain’t over yet. The Council heard public testimony from close to 100 people who came down to support their branch library and park & rec centers. They suggested many different ways to close the budget gap, but their one clear message was NO LIBRARY CLOSURES. What they all also shared were the main reasons they value and need their library: THEY CAN WALK TO IT- IT IS CLOSE TO SCHOOLS AND THEIR HOMES AND SENIOR HOUSING; THEY HAVE LIMITED INCOMES AND THEREFORE LIMITED TRANSPORTATION OPTIONS AND THEY LACK THE MONEY TO BUY WHAT LIBRARIES PROVIDE; NEIGHBORHOOD LIBRARIES FOSTER A REAL SENSE OF COMMUNITY – NOT GENERIC AND CORPORATE. These are very important opinions because 1) the people’s “criteria” for valuing their library clearly has nothing to do with circulation statistics 2) and another branch 1.5 miles away may as well be on the moon for the frail, the elderly, the poor and kids. Without ever saying the words, they articulated the SD master plan concept of a city of villages- walkable neighborhoods with a civic infrastructure of libraries, park and recreation facilities, public transportation, neighborhood schools and affordable housing( all of which in turn attract businesses). That means that library supporters in Cairemont were saying essentially the same thing as those in University Heights, Or Ocean Beach or Benjamin. If we keep this in mind, we can develop a strategy that doesn’t pit one neighborhood against the other, but instead supports the needs we all have in common. We need to be coalition builders. * Next Monday, the 24th, the council will hold deliberations with no public comment and hope to reach a decision. If there are no blips, the decision, whatever it is, will be final on Dec. 1. * That means that our presence at all 7 libraries on Saturday is critical. At the very least, we want volunteers to hand out flyers to patrons with the same message- NO BRANCH CLOSURES, NO REDUCED HOURS, NO STAFF LAYOFFS. We will provide the flyers with that message. I do need a contact person at each location to whom I can give the flyers, so please, someone raise his or her hand and tell me the location. We want to hand out 2,000 flyers, because it is what we do- inform the public! This is a dispicable move by the Mayor to either slash at spending or to SHOCK us into paying more taxes while leaving all of his programs in place for his developer buddies and glutoneous program spending to try to jam density and development down our throughts. Wake up people. This is the jerk you elected. And he was just waiting to let fly with this plan until the dust settled from the election to see if he still had control of the Council. Get out there on Monday even if they won’t let you speak. Send your emails to your councilmember whashisname and let them know that this will be their LAST days in office if they do this. Oh yeah…no more taxes either yo. If they can’t manage the wassamillion dollars each year that we currently give them…then they sure as hell don’t deserve any more of it. Don’t stand for this people!!!!! Wish I could be there to rally for OB Library, but I will be working at my second fave library in the city – University Heights!